31 Down, Seven To Go. The date is the 23rd of February, 2008. Arsenal are about to kick-off against top-flight newcomers Birmingham City at St. Andrews. The Gunners, captained by William Gallas, enter the game topping the table and very much the favorites to win the Premier League during the 2007-2008 season. With Robin van Persie out injured, the Arsenal have seen a nice strike partnership developing between Emmanuel Adebayor (enjoying a brilliant season in which he could hardly miss a chance) and the very much in-form Eduardo, who was bought the previous summer as a replacement for the departed Thierry Henry. It has taken a few months, but Eddie has begun to demonstrate the talents which caught Arsene Wenger's eye: Pace, determination, a silky first-touch, and a finish as clinical as we Gooners could hope for. Eduardo was the real deal. The date is the 26th of March, 2010. Arsenal will kick-off tomorrow at St. Andrews for the first time since 2008 tomorrow, and a great deal has changed since then: Gallas was stripped of the captaincy less than a year after the match (his reaction at the late Birmingham equaliser a sign of things to come), replaced by Cesc Fabregas; Adebayor revealed himself to be a money-grabbing whore that summer and was jettisoned to newly-wealthy Man City a year later (he also revealed he was quite capable of missing a chance or 50); players came and players went. Arsenal began to crumble after the 2-2 draw at St. Andrews, and the title challenge fell apart as an injury-riddled and broken Arsenal side finished a disappointing 3rd. It is the 23rd of February, 2008, and the Birmingham match has just kicked off. Arsenal have begun to play their normal game, controlling possession, passing the ball and making the Brummies chase around, when Eduardo took the ball headed for the Birmingham box. Defender Martin Taylor, whose name will become infamous to Gooners everywhere, slides in with a high, studs-up challenge that breaks Eduardo's leg in two near the ankle, the kind of horror tackle a particularly angry fan might say they hope happens to a rival player, but don't actually mean. Taylor is sent off, but 10-man Birmingham City take a lead into halftime. Theo Walcott scores twice in what should be enough to salvage a win for the despondent Gunners, but a dubious penalty is called on Gael Clichy late on, allowing Birmingham to claw back a point. Arsenal's title challenge begins to unravel. It is the 26th of March, 2010. Eduardo has now been back for a year, but despite showing flashes of brilliance, his finish, his touch, his confidence but most of all his willingness to play with abandon seem to have, perhaps understandably, deserted him. Arsenal are scrapping in a real title challenge for the first time this late on in a season since 2007-2008, and we have seen another promising young player, Aaron Ramsey, cut down by a reckless and violent tackle at another away match in February. 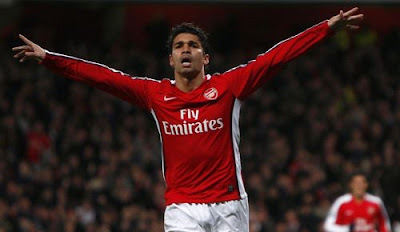 This time, however, the Arsenal have responded with visibly greater unity and (Arsene's favorite term) mental strength. I'm inclined to attribute this change to the leadership in the team. Fabregas, thrust further into the spotlight last season after taking the armband from Gallas, was not initially seen as "natural leader." While he is not perhaps a vocal leader in the Adams/Vieira mold, Cesc has proven an invaluable resource in leading by example, and his fierce desire to win and his team spirit seem to permeate the team. Add to this the experience of Sol Campbell, pressed into service due to an injury to Gallas (to be fair, a consummate professional despite losing the armband) and fiery play of Thomas Vermaelen and the emergence of a number of other key players, and we have seen Arsenal rise from the ashes of what looked, at several points, like a lost season. It is the 8th of March, 2009. Eduardo provides a spectacular finish and his return to Arsenal from a horrific injury at Birmingham looks nearly complete. It is the 26th of August, 2009. Eduardo has drawn a penalty, despite, on second look, getting minimal if any contact with the Celtic 'keeper (and renowned madman) Artur Boruc. Eduardo will be hounded for weeks, and Celtic will unsuccessfully attempt to convince UEFA to ban Eduardo for several matches after the fact, despite the fact that Arsenal win the match 3-1 and the tie 5-1 on aggregate. It is the 26th of March, 2010. Nicklas Bendtner has revealed that he may not be fit for Arsenal's first trip to St. Andrews since what has become known as "the Eduardo game." With Arsenal down to bare-bones at striker, the much-maligned Number 9 is even more of a focal point with the Gunners needing every possible point to keep title hopes alive among Manchester United and Chelsea. Eddie has had a disappointing season, with many fans suggesting that his days in North London are numbered. The influential Vermaelen being suspended, there are questions asked in defense and in midfield as well.